With a career in the homebuilding industry that spans over 30 years, Marty Cherrie noticed that most of the homes he had built during that time were about due for a remodel, so it seemed like the perfect time to launch a home renovation franchise. After looking at the available options, Cherrie chose DreamMaker™ Bath & Kitchen, not only because of our stellar reputation, but also because of our well-thought-out systems and business plan. What do you do for fun outside of your DreamMaker™ Bath & Kitchen franchise? I’m a tactical firearms trainer. It involves teaching people who want to improve their handgun, rifle or firearms handling skills. It's a hobby, one of those other things that I do in my spare time. What about DreamMaker™ made you choose them? I like their systems, they resonate with the way my brain works and the way I've worked in the industry for almost my entire life. Their process, systems, people, their approach, their code of values, they have integrity. To sum it up, I would say they walk the talk. What is the difference between home building and remodeling, and how did DreamMaker™ help you adjust to that difference? 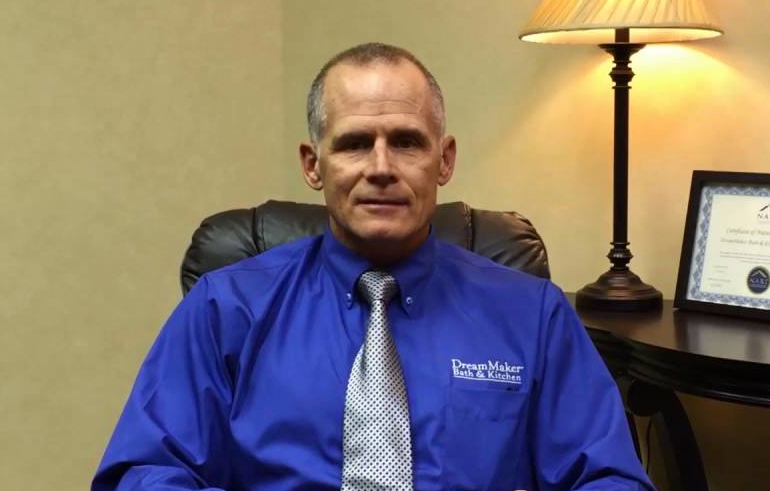 Part of the reason I chose DreamMaker™ is that I've been in the home and commercial building industry for about 30 years. A lot of that has been as a developer, but I’d never developed systems for building or doing the work that we were doing. It was, for lack of a better term, “seat of the pants.” Through the '80s, '90s and 2000s, if you could find a piece of dirt to build on in Southern California, you were probably going to make money at it. As that work went away, or decreased substantially, in 2007, 2008, 2009, I refocused. I actually just quit doing work for a few years. I went to work for a national real estate company and soon realized I couldn't work for somebody else. So, I had to get back out on my own again. I'd built so many homes over the last 20 years and most of them were ready to be remodeled again. If that's what it looked like nationally, then there's a lot of work that can be had in the marketplace. What was your position when you were working for that national real estate company? The name was somewhat misleading, but I was Chief Estimator for the Construction Department. We didn't do any construction, but we did a lot of rehab work. This was the foreclosure market. That house had been sitting vacant for years with deferred maintenance like you can't believe. I didn't think such properties existed. I didn't know what preservation was until I went to work for this company. We did estimating, virtual estimating, all day long, every day. I went to one project that was close to where we lived, and the rest of them I would just virtually estimate them online. Somebody else did the follow-up. What are your impressions of the group of franchisees at DreamMaker™ that you've become part of? To be honest with you, it's a lot like what I expected based on the exposure I had to corporate and the training. I had talked to a few of them a little bit. They're motivated guys. They're committed to a system, which is the whole reason why I'm here. It's consistent, therefore it has integrity. I'm sure there's probably some franchisees that are on that periphery, that aren't all there, because they're not here this week, but for the most part these guys are engaged and doing it. How many folks are on your team getting started? It's just me, myself and I at this time. As we grow, there will be more people. DreamMaker™ gives you the model. If you want to do this much, this is what it's going to take. When you're doing this much, this is what it's going to take to grow. There are some good milestones as it grows to build with. For in-depth details about the DreamMaker™ Bath & Kitchen home renovation franchise opportunity, fill out a form to download our free franchise report and start a conversation with us. You also can learn more by visiting our research pages. We look forward to meeting you!